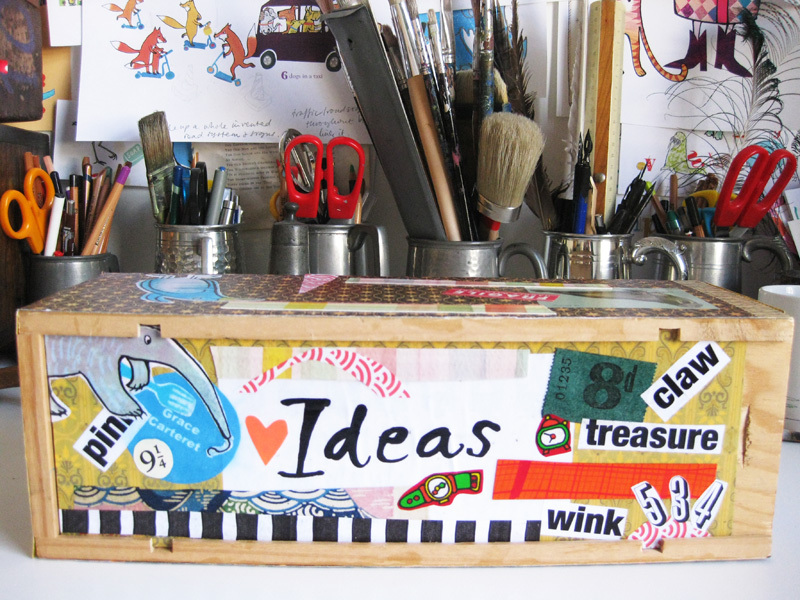 I found out last week that the great children’s writer Allan Ahlberg keeps an ‘ideas box’. Whenever he is struck by a combination of words or a particular thought that has potential, he scribbles it down and posts it in the box, which then acts as a resource for future writing. Apparently, ‘The Jolly Postman’ spent some years in there before emerging as one of the most delightfully original children’s books of the last 30 years. This struck me as a very good idea – so I have made myself an ideas box, and intend to fill it. I’ve collaged it with bits and pieces, some leftover from school workshops (Grace Carteret was a housekeeper at Ham House many many years ago), then given it a coat of PVA as an easy varnish. I’ve put a couple of embryonic ideas in there to get it started, and might trawl through some old notebooks: this is where I normally note ideas, but inevitably forget them once the page has been turned or a new volume started. I’m thinking of it as a low-energy slow cooker – I’m going to let a few ingredients bubble away in there and see what happens. This entry was posted in General news, Inspirations, New ideas on February 4, 2013 by Jane Porter.